If we are to examine from the inside the machinery of contemporary error, we must step outside of our theological skins. Everything that gives shape and meaning to our conception of the span of human life derives from a system of beliefs that the post-Christian mind rejects. The Christian finds the ultimate meaning of things outside time, outside the boundaries of our earthly human career. I’m afraid that Mr Blamires is mistaken on several counts. As the rest of his book points out, he generally defines “Everything that gives shape and meaning to our conception of the span of human life” as a set of morals based upon family values. For instance, he harps on the attack against the sanctity of marriage. While I agree that the value of marriage has been greatly reduced in Western society, I believe that the Christian community is largely at fault. By this, I mean that the Christian community has not demonstrated a great apologetic for marriage, giving no standard by which to critique the ‘secular’ tendency to divorce. My second main issue with Mr Blamires’ words has to do with a general presupposition concerning the utter ‘otherness’ of the Christian life, one in which we find “the ultimate meaning of things outside time, outside the boundaries of our earthly human career.” While God is most certainly greater than our realm, he is also very present and committed to time and space, which is most fully demonstrated in the Incarnation, the giving of the Holy Spirit, the advent of the Church and the rapid expansion of his universal kingdom. This is very close to what I think we need to hear, but the language of ‘exile’ is too heavy-handed. Frost is very glad to leave what he considers the “Christendom era”. To set ourselves apart from the Christian tradition and to adopt what we consider to be ‘the message of Christ’ is dangerous. This is a mistake primarily because ‘the message of Christ’ is convoluted, and if we limit this message solely to the Scripture (as is by-and-large the practice of Protestantism) we undermine the very nature of Scripture. Scripture was not given to the Christian community as a tool by which we can live without the Church. 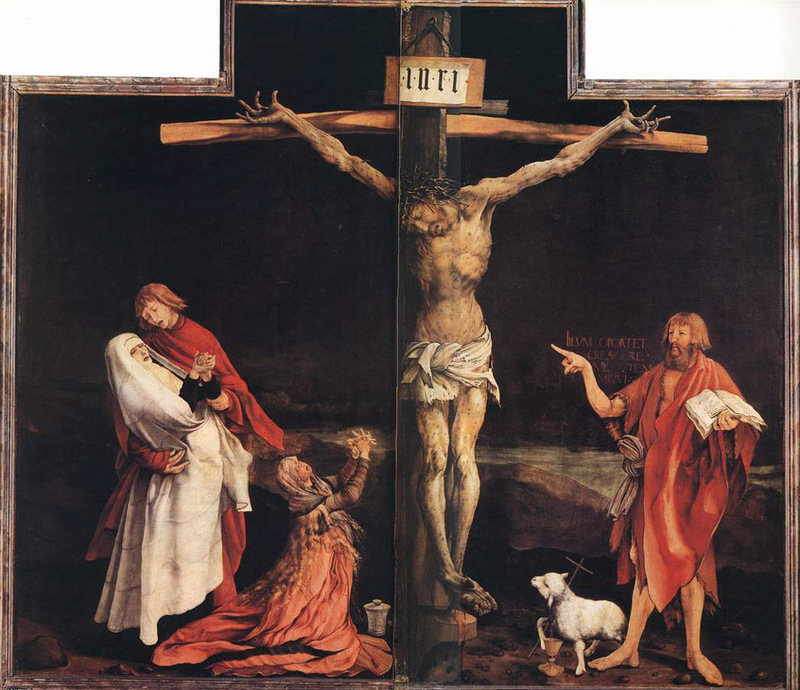 That old Lutheran ideal, Sola Scriptura simply does not account for the robustness of the Christian presence throughout history. We are dealing with a living God and a living Church. While Christianity is something very contrarian, we cannot accept that we are so holy and counter-cultural that exile is a result of our ‘doing things right’. The Christian community could do well by listening to the culture in a self-critical way. Unfortunately, I believe that this can be done wrong. In fact, I believe that the Christian community is experiencing its present dilemma because it has been taking the things of God, the way we rehearse the Gospel, the way we understand our role in this world, and severely altering it based upon our preconceived notions of how things should be. For instance, during the time of the Reformation, Calvinists began to wear black, not initially to express modesty, but to align the clergy with academia, showing that the Reformed priests were educated, unlike the Catholic priests who wore colourful vestments based upon the seasons within the Church year. Changing our faith based upon preconceived notions has had far more adverse effects than the clerical wear of the Reformers, the most tragic of which I believe is the castration of the Gospel. What I mean by this is that the far-reaching effects of the Gospel have been greatly minimised in order to attend to the desires of Western culture. The culmination of Christ’s life, death and Resurrection has moved from an incredible cosmic event in which the transformation of the universe was initiated and the Church created and redeemed into a hyper-individualistic ticket to a spiritual heaven paradise. Was not the God of the Nicene Creed the God who created all things, visible and invisible? Christianity is not a set of morals, it is not a set of mental suppositions and it is not a social programme – it is God’s transformative initiative in the universe, the Gospel. The Gospel is therefore the heart of Christianity and the heart of the Gospel is love. Perhaps the primary reason why Christianity has experienced such a drop in public sentiment is because love, and consequently the Gospel, has been corrupted and void of much of its usefulness. Now I will neither deny the sincerity of the entirety of the Christian community nor the power of God as demonstrated through even the most meagre of Gospel proclamations. We are fortunate that God is far more powerful and mysterious than our systems of belief, no matter how informed or refined. What I am going to propose will not change the fact that God is far more than we comprehend on a daily basis, but I do hope that, as should be the case in any theological endeavour, this exercise will serve to draw us as the Christian community closer to the heart of God and his mission to the world. His mission is not one of ‘add-ons’. Being a Christian is not an ‘app’ one can purchase for their iPhone. Being a Christian is neither a new t-shirt nor a whole new wardrobe. Being a Christian is a radical transformation and orientation toward the will of God. You have heard that it was said, ‘You shall love your neighbour and hate your enemy.’ But I say to you, Love your enemies and pray for those who persecute you, so that you may be children of your Father in heaven; for he makes his sun rise on the evil and on the good, and sends rain on the righteous and on the unrighteous. For if you love those who love you, what reward do you have? Do not even the tax collectors do the same? And if you greet only your brothers and sisters, what more are you doing than others? Do not even the Gentiles do the same? Be perfect, therefore, as your heavenly Father is perfect. Indeed, the love of Christ is not some half-hearted commitment not to hate. The Christian community has a propensity to take the positive commands of God and turn them into negative commands. Instead of this radical calling ‘to love everyone’ we turn it into a meagre calling ‘not to hate anyone’. Even then we must weaken our definition of hate and say, “Well I don’t hate anyone, I simply dislike some people.” Whether we define our lack of love as ‘hate’ or ‘dislike’, we are still missing the point – we are called to love. But we must also understand that the love of Christ is a very complex thing. God does not suspect that we will master his greatest commandment with relative ease. To love in the way that the Christian community is called to love involves a daily dependence on God’s strength and guidance by way of his Holy Spirit. We can hardly even begin to imagine what it is to love in the way that God demonstrated through Christ. Even on the Cross in the midst of his persecutors tradition maintains that Jesus requests of his heavenly Father, “forgive them; for they do not know what they are doing.” (Luke 24:34) Jesus’ love is a radical love, and it was a love that brought about massive transformation: reconciliation between God and people (‘love your God’), reconciliation between people and other people (‘love your neighbour’; ‘love your enemy’), reconciliation within individuals toward themselves and reconciliation between people and the creation. The greatest commandments can summarise this grand reconciliation. If we love God in the freedom granted by the work of Christ we will love the entirety of his creation because he has created, loved and redeemed it. This holistic reconciliation in the Gospel can be used to counter the neo-Gnostic trajectory of contemporary Christianity. When considering the implications of these reconciliatory principles, the unfathomable depth of the love God has for us and the love that God has called the Christian community to, I believe that a it is a good exercise to seek to see it all from the perspective of the Cross. Remember Christ’s love on the Cross. Be transformed by Christ’s love on the Cross. Exploring and employing the implications of God’s love is an eternal task, but I end this post with these thoughts: To be a Christian is to be a subject in God’s kingdom and to be a subject in God’s kingdom requires one thing: robust obedient love. This world can only ever benefit from more love. Nothing in this world ever went bad nor will anything ever go bad because there was ‘just too much love’. Jim Carrey as Joel Barish from Eternal Sunshine of the Spotless Mind (Michel Gondry, 2004). This particular film was pegged as both Greg and my number one pick for the last decade and currently is placed fourth in both Greg and my top ten film lists. The film itself is a masterpiece. The screenplay by Michel Gondry and Charlie Kaufmann is incredible. The surrealistic and deconstructed story telling really gives the viewer a very unique cinematic experience while remaining extremely logical and precise. 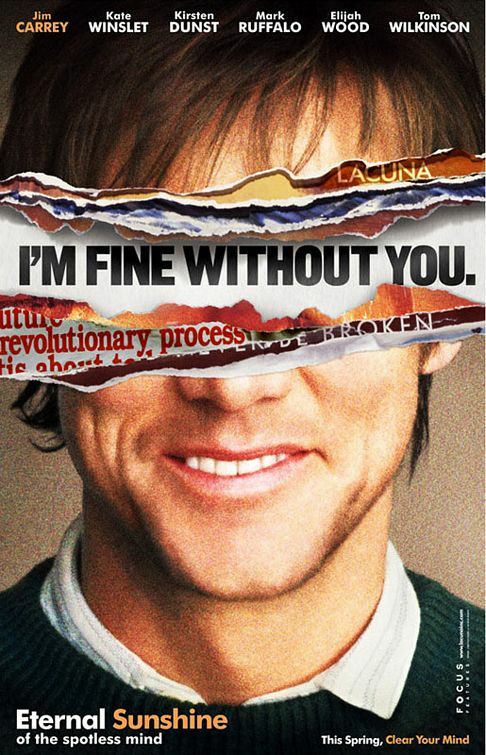 The acting of Jim Carrey and Kate Winslet (as well as the supporting cast – David Cross as Rob, “Carrie, I am making a birdhouse”) is top notch, while the score by Jon Brion is imaginative, beautiful and haunting. These many strengths are often the focus of reviews, but what I believe is the most compelling aspect of this film is the unique way that it uses science fiction to explore and communicate some of the most profound thoughts on the nature and possibilities of love. Warning: plot spoilers follow. 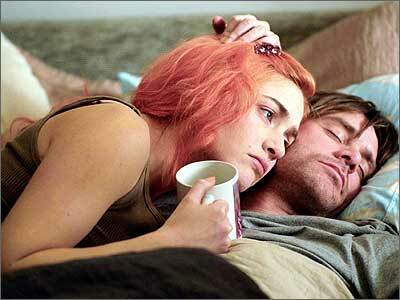 Throughout the film we see the breakdown of the relationship shared by the two main characters, Joel and Clementine, except in reverse as Joel’s memories of the relationship are being systematically erased during a [science] fictional medical procedure. Throughout the reliving of these memories we experience the real frustrations that Joel and Clementine faced as two very different people sharing life together (Joel being generally presented as more reserved, simple and logical, while Clementine is generally presented as free-spirited, impulsive and emotional). In the end (chronologically), Joel and Clementine (who have both had their relationship erased via the procedure) have subconsciously ended up at the same place, Montauk, where they had originally met some two years prior. They begin to hit it off despite the obvious personality differences, but later on discover that they had previously dated for two years and they listen confusedly to separate recordings they had made before the procedure, explaining why each wanted to erase the relationship from their respective memories. Throughout the film we have discovered exactly why Joel and Clementine have fallen apart, but we have also witnessed unique and profound experiences that the two have shared, leaving us regretful for their inevitable break-up. Joel “Okay.” Joel is content. Highlighted by Beck’s amazing cover of The Korgis’ ‘Everybody’s Gotta Learn Sometime’, this ending always leaves me in tears because of the incredible way it presents life. Life is that dialectical tension between the broken and the beautiful, and in God’s grace the broken is made beautiful. Similarly, the tension of the Gospel is that the wholly-other God, unknowable by a broken universe, has effectively participated in human suffering in Jesus Christ and has invited the broken universe to know him, and in knowing him the broken universe is recreated. In the end, Joel and Clementine accept a love that is not ‘perfect’ by many standards, a love that is neither about the perfect timing nor about the perfect compatibility, but a love that is based upon a simple, yet profound commitment between two broken people – “Okay.” “Okay”, knowing full well that they will hate a lot of the other person and “Okay” knowing that to love is ultimately worthwhile.